When I search for stained glass for kids I always found the craft uses Clear Contact Paper. I went shopping and thought I had bought clear but it turns out it is grey. Not good. But I decided to try my own version of this craft and instead of using contact paper I used clear plastic wrap and glue. Cut the tissue into squares or any shape the child can cut. Make a pile of the different colours. Put the clear plastic on a piece of construction paper (the better to see what you are doing and holds the plastic in place. Cover a large area of the plastic with glue. Start putting the tissue pieces on the glued area. Overlapping is fine. Cover with more glue. Fill the entire area where you think you will cut out your figure (I am using a turtle). Wait for it to dry or hurry it along with a hair dryer. Draw the turtle and cut him out. Draw around the piece on the construction paper. Cut out the construction paper turtle. Cut inside the turtle so that you have a turtle frame. Put glue around the edge and paste the stained glass to the frame. 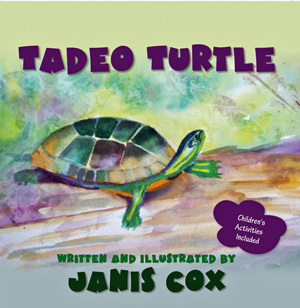 If you purchase a Tadeo Turtle from my website I will send you an autographed copy. You will also receive a free ebook and a card (butterfly, hummingbird or fall forest). Please check out more about my book Tadeo Turtle on Tadeo’s Page. You will find more activities at the back of my book. And a 24-page curriculum is available if you ask. You can use a credit card when you click on the PayPal Icon – you don’t have to use PayPal. To find more craft ideas from He Cares for Us go to Crafts for Kids. After you link below, please visit others and encourage them. Please link only ART ACTIVITIES. Thank you. I am going to continue this linky for a month. So keep adding your art activities. This entry was posted in Creative Saturdays and tagged #CreativeSaturdays, art, craft, Crafts, glue, Janis Cox, kids, Stained glass Tadeo Turtle, tissue paper on December 7, 2013 by JanisCox.